529. Tulliallan Castle.-This castle (Fig. 437) is situated on the left bank of the River Forth, half a mile north-east of the river and three-quarters of a mile north-west of Kincardine. Although a ruin, it is of special interest, as it has features of arrangement and detail unique in Scottish architecture. In places the site is marshy and unsuitable for heavy building, but in the north-east corner there is an outcrop of rock, nowhere rising higher than 10 feet, and on this the castle is erected. It stands within an enclosure, roughly D-shaped and girt with a broad ditch having a rampart outside of it, the chord of the arc being on the north. OUTWORKS-Only here and there is the rampart traceable, and the western end of the straight part of the ditch is now difficult to distinguish. The enclosure is entered from the south. 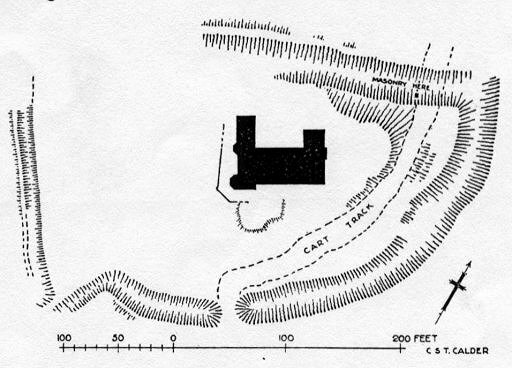 The present entrance is possibly modern and has apparently replaced an original entrance, the position of which is probably marked by a small re-entrant in the arc, 50 yards farther west. Between this latter point and the northwest angle the ditch is only 13 feet in breadth. Elsewhere it has an average breadth of 30 feet. The ground in the north-east corner is uneven and may conceal the foundations of an outbuilding. Close at hand, but within the ditch, is a fragment of masonry, which may perhaps represent the remains of a conduit or sluice. THE BUILDING.-The castle is not wholly of one time, and the date and extent of the earliest work in it are in some doubt. It consists of an oblong main block, facing south and running roughly east and west, three-storeyed at one end and four-storeyed at the other, while two wings which have obviously been added to it project from its northern wall in alignment with the gables. At its south-western angle is a tower which projects only slightly on the south, but develops into a semi-octagon on the west (Fig. 438). This contains the principal staircase. A semi-hexagon in which there is a service stair, is placed midway along the western wall, masking what may once have been the northwest corner. The ground floor of the main block, with the lower part of the south-west tower and of the two staircases, is not unlike 14th-century architecture. The general plan, however, is characteristic of castles erected a century later, while the upper storeys of the parts just mentioned, in so far as they are original, can be definitely ascribed to the 15th century. The wings are apparently additions, that on the west being a modification introduced when the ground floor of the main block was actually under construction, while that on the east cannot be much later. There are two entrances on the south, the principal one in the south-west tower, and the other at the east end of the main block. The former was protected by a portcullis and a barred door, while a mound in front of it may be the foundations of a detached structure on which the outer end of a drawbridge rested when lowered. No ditch can be traced. The gateway, however, is rebated to receive the drawbridge when raised and above is a rainure for the cable or chain. The entrance at the east end, which opens directly into what must have been the old hall, had also a drawbridge, as well as two doors with bars, while in addition there seems to have been a movable shutter sliding in an opening formed in the soffit between the doors. A third entrance at the north-west corner gives admission from the west wing, but was apparently designed to be external as it had two barred doors. This points clearly to a change of plan. From the mound in front of the main entrance a retaining wall runs along the western side of the castle, to support a terrace overlooking ,what was probably the garden. The masonry is of ashlar, the courses averaging 11 inches, and is mainly cubical but with a certain number of stretchers up to 2.5 and 3 feet in length. The walls, which are 6 feet thick, are built with an outer and an inner casing, the headers on each having a depth of 9 or 10 inches. At the base they have a batter of 2.5 degrees, which extends to a height of 9.5 feet on the front, but is lower elsewhere. For the greater part of its length, beginning from the eastern corner, the façade presents a view of two storeys and an attic, the floor of the attic being just beneath the wall-head. But as the re-entrant angle formed by the south-west tower is approached, the wall-head rises and the attic becomes a third storey. About the middle of the tower it rises again to form the front of the cap-house, from which a higher parapet-walk was reached. 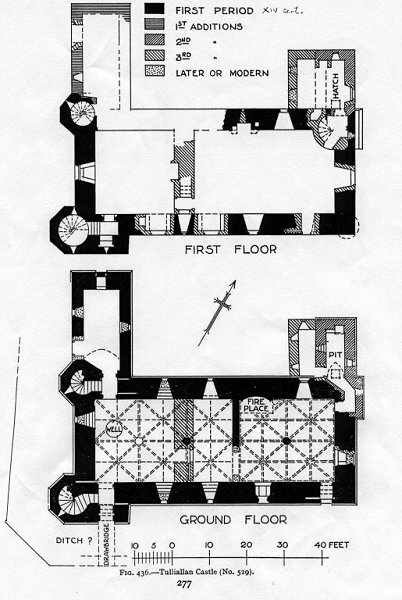 There is nothing to show how communication between the different levels of the walk was maintained, but the parapet has been borne on corbels of slight projection, double-membered on the tower and single on the main block except where a circled encorbellment of three members has supported a southeast ” round.” There are three windows on the ground floor, all of them original and all once provided with shutters, which seem to have been movable and to have been fastened from within. The two on the west, which are chamfered on jamb and lintel, are only 16.5 inches square. But next the eastern door is a larger one, which lit the original hall and which has been a narrow but elaborate light in two orders, the outer with a trefoiled head, the inner now destroyed. On the first floor, besides a slit in the wall of the tower, designed to light the staircase, there are two great windows on the south with chamfered jambs and lintels. These have been enlarged, apparently in the 16th or 17th century. Between them is a narrow slit, which retains its original form, although the mural passage which it now lights is of later construction. To the east of them, and on the same level as their upper part, are two smaller windows, both original. Below these are, respectively, a later window of uncertain date and a door, formed in the 16th or 17th century, and approached apparently by some form of wooden construction of which no trace is now left. The attic was lit by small windows which can be seen between the lower corbels and which must actually have been at its floor level, a quite abnormal arrangement. On the west side of the main block there is only one small window on the ground floor. This is set between the staircases and is of the same size and character as the windows at a corresponding level on the front and elsewhere. On the first floor is a large window with jambs and lintel, built in two orders rather elaborately chamfered and moulded. Beyond the smaller turret, in the wall of which is a narrow slit to light the service-stair, the wall-face of the wing projects farther than the general plane of the main block. It has already been stated that the wing was an afterthought, and the masonry shows that it has subsequently been raised, in the course of some reconstruction, in order to increase the height of the upper storey. Beneath is a modern door, as well as one small window of the usual ground-floor type and above are a small narrow window and a wide window which has projected as an oriel. On the north the upper portion of the walls of the west wing and of the main block has disappeared. Towards the junction of the latter with the east wing, however, part of the wall-head remains with a few of the corbels of the parapet, while the east wing itself is nearly complete. Its uppermost storey is intaken on the gable, and the skew is crow-stepped. The gables of the wings contain garderobe shoots, the eastern one discharging below the present ground-level, while the outlet for that on the west is marked by a cutting back of the rock, although the actual opening is now built up. On the inner side of the west wing there is one small square ground-floor window. On the main block there are three, and above these are a built-up narrow light with a heavy chamfer on jamb and lintel, and, at the junction of the east wing, a square window also chamfered. In the east wing there are two narrow lights on the inner side at ground-floor level, with other two above, now built up, and two similar openings in the lower part of the gable, one on the west, the other on the east. The differences in the character of the masonry here are as distinctly marked as they are significant. The lower part on the east is the oldest portion of the wing. When it was doubled in width, perhaps about the beginning of the 17th century, the material used was a rough uncoursed rubble. Later still the whole of the upper part was built in ashlar at one and the same time. Examination of the east side also reveals the process of accretion very clearly, three successive stages being obvious. The oldest masonry, that of the main block, extends from the southeast corner as far as a buttress-like projection which masks the north-east corner as it was before the wing was added. The corbels for the original parapet pass above the buttress, and the line is continued as far as the present north-east corner by the broken remains of others, apparently later and designed to support the parapet of the second period. In the third period the wing was given an additional storey and crowned by a crow-stepped cap-house, the highest part of the whole structure, both of these being reached by a turnpike which rose from the first floor. On the main block room was left for the parapet-walk by making the gable which received the roof rest upon the inner casing of the wall. The eastern windows are chamfered on jamb and lintel except for one on the ground floor. This last, which is original, appears to have had a trefoiled head, but has been partly built up. The principal entrance to the castle is that in the south-west tower. Beyond the foot of the staircase, which is on the left, a door, once provided with a bar, admits directly to the ground floor of the main block. This was originally divided into two chambers of unequal length. The western one was the longer, measuring as it did 37 by 22 feet. It was ceiled with a double series of three quadripartite vaults without ridge or wall-ribs, the arch-ribs being received on two central piers, octagonal in section. The western pier is missing, and the vaulting above has consequently collapsed. The other pier has been built up in a stout transverse wall which was subsequently erected, shutting off one third of the room from the rest and carrying a heavy partition on the floor above. The small windows here have sloping solid breasts and obtusely pointed rear-arches. In the floor is a circular well with built sides, while the north-western corner of the chamber is slightly dished back for a bucket to stand in. The eastern chamber was entered from the western one through an archway and was apparently the original Hall, although the placing of the Hall on the ground floor is most unusual. It is almost square and has a double series of two-ribbed quadripartite vaults, with ridge- and wall-ribs; the central pier is octagonal and has a moulded capital and base (Fig. 439), unlike the surviving pier of the other chamber, which has no capital. The windows, which look north, east and south, are more elaborate than the other windows at this level, and two of them are or have been provided with seats. The breasts are stepped and are at a considerable height from the floor; a ‘banker’ must have been used as a lower step to reach them. What was originally the largest window has been masked when the east wing was doubled in width. In the north-west corner of the chamber, a very curious position, is a fireplace, the only one on the ground floor. It is greatly destroyed. Projecting jambs of a heavy rollsection bend outwards at the top to support a projecting hood, on each side of which is a moulded lamp-bracket. The back of the fireplace is slightly dished, and the vent is small. In the north-east corner a door, the lintel of which is a ‘Carnarvon arch,’ apparently led to a garderobe in the original arrangement. The door just mentioned now leads to the older portion of the east wing by an angled lobby, the outer wall of which is the buttress-like projection spoken of above. Here was the ‘pit,’ a long narrow cell covered with a pointed vault, in which there was a hatch ; in the gable is a large garderobe and on each side was a small window. The single room in the west wing on this floor was reached from the northwest corner of the western chamber, where there is a door leading into a small lobby with the service staircase on the left. It is ceiled with a very flat pointed barrel-vault and has a garderobe flue in the gable. It is somewhat anomalous to find that to reach the first floor from the Hall it should have been necessary to return through the western chamber to one or other of the staircases on the west. That in the south-west tower, a turnpike, is wide, and the steps with their continuous chamfered corbels illustrate a Gothic form of construction. On the first-floor landing is the portcullis room, a little lobby with provision for the mechanism of portcullis and drawbridge and for a seat. Although certainty is no longer possible, there is some evidence to suggest that the first floor of the main block originally formed a single chamber of hall type, lit by the existing west window, by a similar window in the gable opposite and by small windows in the side walls, the fireplace being in the north wall. Subsequently it was divided into two by the insertion of a transverse partition, resting upon the partition wall similarly inserted on the floor beneath. The chamber thus formed at the western end is the smaller of the two and measures 21 by 22 feet. The two windows that remain were of considerable size to begin with, and the one to the front has been enlarged, while both were furnished with seats. In the centre of the partition is a fireplace of 16th century type with moulded capitals, shafts, and bases. The same wall contains a narrow straight staircase rising to the attic floor above the western part of the main block and possibly also to the lower parapet-walk. The chamber beyond the partition measures 37.75 by 22 feet, and has in the back wall a fireplace, in the jamb of which are the remains of a locker, while in its breast there has been a narrow window now built up. As has been stated in describing the exterior, the two small windows high above the floor are original, and have sloping breasts, but the others have been enlarged as is shown on (Fig. 437). At the north-east corner of the room there seems to have been a garderobe within a mural recess, but, when the east wing was added, the back of the recess was cut through to give admission to it. Still later, when the wing was raised in height, a new staircase became necessary and a turnpike was inserted here. Above this level the floors have disappeared so that the upper storeys are now inaccessible. The west wing is even more dilapidated. A certain amount of repair work has recently been carried out, but the masses of ivy, which cover the upper parts, tend to disintegrate the walls. While the vault of the hall and the floor above have been made secure, the other vault, which was equally interesting, has almost entirely fallen. It is most desirable that steps should be taken to prevent further damage. 1Bain’s Calendar of Docts., ii, No. 1514. 2The Douglas Book, Sir William Fraser, II, pp. 402, 406. 3Reg. Mag. Sig., s.a., No. 1644. 5Pitcaim’s Criminal Trials, III, p. 479.